With the NBA entering its final stretch to the postseason, college basketball closing in on March Madness, the NHL winding towards the Stanley Cup playoffs and Major League Baseball preparing to open its season in just over a month, many sports fans and bettors might not have college football at the top of their list. Nevertheless, odds makers never slow down and never put any sport to bed for more than a few hours. This week, the 2015 Heisman Trophy futures were released by on large online bookmaker. The season does not even begin until the latter part of August, but there is nothing like getting a head start and finding a player or players with some value on this futures board. Last season the prestigious award was won by Oregon Ducks quarterback Marcus Mariota. The junior quarterback won in a landslide but already has entered the 2015 NFL draft. 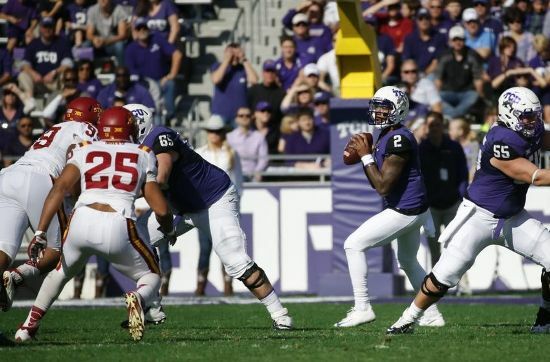 As is usually the case, the player at the top of the list with the shortest odds to start the Heisman Trophy futures is a quarterback and this year it is TCU Horned Frogs quarterback Trevone Boykin. The athletic Boykin is a dual threat who can beat defenses through the air with his arm or on the ground with his legs. After the talented Boykin is Ezekiel Elliott a running back for the Ohio State Buckeyes. Bettors might be indecisive when it comes to backing the talented runner considering there are three of his own teammates on the newly released futures list that will be bet on as well. Ohio State has three quarterbacks on the list. Braxton Miller is 25 to 1. Miller was supposed to be the starter last season, but injured his shoulder prior to the start of the season and was lost for the year. J.T. Barrett is at 25 to 1 as well. He replaced Miller only to become injured himself late in the season. Cardale Jones is sitting at 15 to 1. He replaced Barrett and helped lead the Buckeyes to the National Championship. Rounding out the top five with the shortest odds is Dak Prescott the dual threat quarterback for the Mississippi State Bulldogs, Leonard Fournette a running back for the LSU Tigers and Paul Perkins a running back for the UCLA Bruins.